Some 20,000+ people from across the UK will be at the Emirates Stadium in London on Saturday (8 July, 1pm) to hear international evangelist J John preach. J John is a large-scale proclamation evangelist, who has preached in stadiums and arenas across the globe. There hasn’t been an event on this scale in the UK since American evangelist Billy Graham visited 32 years ago. After recent events, there is a greater need than ever for communities to unite behind a message of hope and compassion, following the fire at Grenfell Tower and recent terrorist attacks in Manchester, London Bridge, and just down the road from the Emirates Stadium at Finsbury Park Mosque. After the attack at the Finsbury Park mosque a mob formed around the attacker, but the Imam stepped in calling for restraint and calm. J John argues that all the world’s problems are born out of a lack of forgiveness. While governments and charities attempt to alleviate the symptoms of these problems, faith leaders can tackle their root cause, as the Christian message is one of forgiveness for the past, new life today and hope for the future. At Emirates Stadium J John will speak on this essential Christian message with over 20,000 people looking for hope, and it is a message that can bring real change to people’s lives. In 2012 J John hosted just10, a series of events focusing on the Ten Commandments, at the end of each he offered people the opportunity to seek atonement for each of the commandments they had broken. When he spoke about stealing he asked people to return what they had stolen, and set up amnesty bins for those who couldn’t return things to the people they had stolen from. Afterwards, more than £500,000 was found in the bins, which was then donated to hospices and charities. Following the commandment on murder he called for an amnesty of weapons which saw people handing in knives, guns and ammunition, cleaning up the streets. In Liverpool, so much ammunition was handed in that the police had to take it away in two armoured vehicles. He hopes that JustOne will trigger a similar outpouring of goodwill from all those who participate. 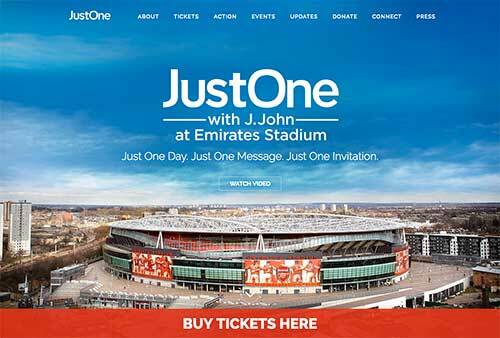 JustOne at Emirates Stadium is an event intended to give thousands of people an opportunity to hear the relevance of Jesus Christ and follow Him. It is intended to be the first in a new season of Christian stadium gatherings around the UK. J John is preaching in football stadiums as they are the ‘secular cathedrals’ of our time, but he also points out that more people go to church each Sunday than go to football matches on a Saturday, showing the enduring need for faith in people’s lives. The event will feature worship from renowned Christian worship leader and Grammy award-winning songwriter Matt Redman, as well as music from the London Community Gospel Choir, who have worked with artists such as Madonna, Tom Jones, Adele and Sir Elton John.